Several years ago, I began experimenting with baking my own. I tried a number of approaches, including kneading fruit and spices into frozen bread dough, mixing everything up in the bread machine, and making yeast bread by hand with three risings. My kitchen is always pretty cool, though, and getting bread to rise is difficult (which is one reason I often start with the bread machine). Then I ran into this recipe for Hot Cross Muffins on the King Arthur Flour web site and never looked back. It’s not really traditional, it’s true, but somehow the texture and flavor is better than you’ll find almost anywhere in the real thing. And it’s amazingly easy to throw together. The secret is adding yeast as well as baking powder to the dough. It gives the finished muffin a firmer texture and a pleasant yeasty flavor. Although you must allow the dough to stand for about 40 minutes before scooping it into the muffin tins, it’s not expected to rise much. No kneading or shaping in required. A little potato flour, or dried potato flakes, keeps the dough moist. The flour is fairly to easy to find now that so many people are eliminating gluten from their diets. I’ve done very little fiddling with this recipe aside from adding a generous portion of lemon zest to get some of the citrus flavor associated with the customary dried citron and lemon peel. Taste one and you’ll share the pleasure of the English, who considered spice buns such luxuries in 1592 that the London Clerk of the Markets decreed the city’s bakers could sell them only at burials, on the Friday before Easter, or at Christmas. The ban didn’t last long. 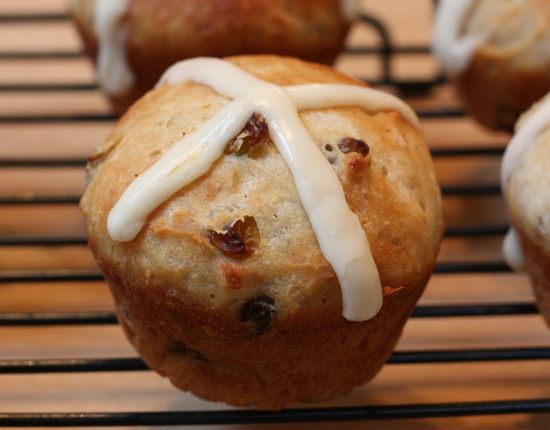 Buns with a cross incised on the top had been a fixture in England since the Saxons ate them in honor of Eostre, the goddess of light whose name was given to Easter. The Catholic church transformed the buns to Christian purpose, and some sources cite the monks of St. Albans Cathedral in Hertfordshire handing out buns stamped with the mark of the cross to the poor on Good Friday in the 14th century. The cross is now made of icing, which adds just the right measure of sweetness to the bread. 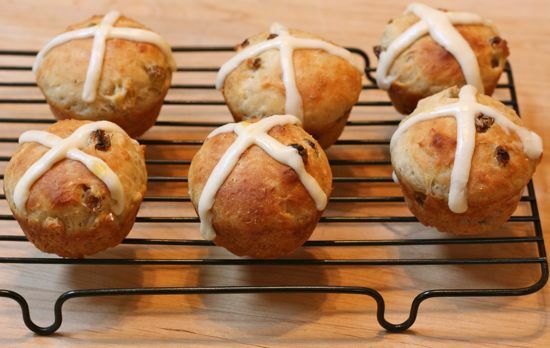 Although these treats are usually associated with Good Friday, you don’t have to be Christian to appreciate a good hot cross bun. A little cross-cultural culinary exploration is good for everyone. Mix raisins and water in a small bowl and set mixture aside. In a large bowl, thoroughly whisk together flour, baking powder, salt, potato flour, sugar, yeast, cinnamon, nutmeg and allspice. In another bowl or large glass measure, beat together eggs, water, melted butter, lemon zest and currant mixture (including any remaining soaking liquid). Make a well in the dry ingredients and pour liquid ingredients into well. Stir together with wooden spoon until all ingredients have been incorporated and dough holds together. It won’t be smooth. Cover bowl and let dough rise in warm place 45 minutes. It will look a little puffy but won’t rise much. Preheat oven to 400 degrees. Stir dough briefly to deflate and use a 1/4-cup measure to fill 18 greased muffin cups about two-thirds full. Let muffins rise, covered with a floured cloth, 20 minutes, until they’ve risen almost to the top of cups. Bake 20 minutes, until they’re light golden brown. Remove from pans and allow muffins to cool for 5 to 10 minutes before icing. Combine icing ingredients in small bowl and beat until thick. Fill a zippered plastic bag with icing, squeezing it down into one corner. Snip off tip of bag and squeeze two thick lines of frosting onto muffins in the shape of a cross. I have to tell you how much I like your site. The recipes. The photos. The excellent descriptives. Everything about it is great. Many thanks.